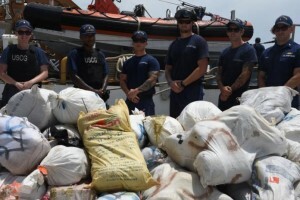 KEY WEST - Crewmembers aboard the Coast Guard Cutter Thetis offloaded 2,116 pounds of marijuana on Friday in Key West after returning home from an 88-day patrol in the Caribbean and Atlantic Ocean. In March, Thetis crewmembers alongside an MH-65 Dolphin helicopter crew from Air Station Borinquen, Puerto Rico, and a Jamaican Defence Force crew interdicted a suspected drug smuggling vessel in the Caribbean. The drugs, worth approximately $2 million wholesale were interdicted as part of Operation Full Court Press. Also during the patrol, Thetis crewmembers worked with the Coast Guard Cutter Heriberto Hernandez crew and the Puerto Rico Joint Forces of Rapid Action to rescue and repatriate 29 Dominican migrants. During a port call in San Juan, Puerto Rico, crewmembers volunteered with a local nonprofit food bank and loaded more than 300 pre-packaged meals for distribution to community members disadvantaged by the 2017 hurricane season.